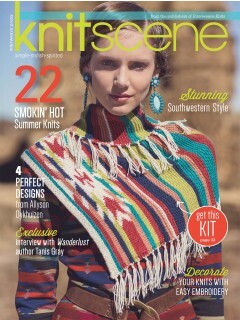 Knitscene Summer delivers 22 sizzling knitting projects! Featured designer Allyson Dykhuizen takes to the sandy shores of the Great Lakes with transitional beach wear, and there are eight projects inspired by the bold colours and patterns of the US southwest. You'll find a little twist in four projects with surprising elements, and the issue is wrapped up with a seven feminine patterns and a dance party. Brenda K. B. Anderson walks you through using lace as an embroidery template.